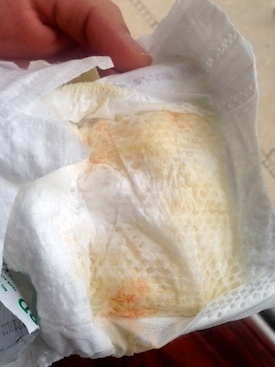 We are concerned about finding red colored urine in our newborn’s diaper. He is 4 days old and breastfed. Is this blood? He has not been circumcised. Overall he is acting well, but we are obviously very concerned. This looks like “brick dust” urine caused by the presence of uric acid crystals in his urine. During the first few days of life children usually loose weight. This weight loss reaches its peak at three to four days of life. Breast fed infants loose weight while waiting for the mother’s milk to “come in”. When newborns loose weight they are loosing “water weight” and becoming relatively dehydrated. As they loose water their urine becomes increasingly concentrated. If it becomes concentrated enough it will crystalize and appear as a red/orange color in their diaper. On one hand, this is normal and not likely blood. On the other hand, this is a sign of dehydration and weight loss. While we do expect weight loss in all newborns ( up to 10%), it is best that you take your son to his doctor. It is important for him to weighed and evaluated. Take the diaper or pictures of the diaper with you. Hopefully, he will have lost less than 10% and hopefully is mother’s milk is “coming in”. Given a couple days and some milk the red color in his urine should resolve.